" I have done several catalog projects with PFL and my experience has always been positive. The customer service is just phenomenal - they work with you to make as many changes necessary to ensure you're happy with the result. They also seem to really care how the project turns out, taking the time to adjust files and help improve the final catalog. On one occasion I started my trade show catalogs way too late and they rushed my project and got it to me in time at no extra charge. Great company. I recommend them without hesitation. " "I just wanted you to know that you guys are the best. I'm not sure I have ever experienced customer service in any arena of my life quite on par with your team. And an on time beautiful-as-always catalog? Am I dreaming?" Learn all you need to know to successfully use direct mail to grow your business. Need short run catalogs in multiple versions? Call 800-­930-2423 now for pricing! There is more than just the same old 8 1/2 x 11 Catalog printed on glossy paper available at PFL. 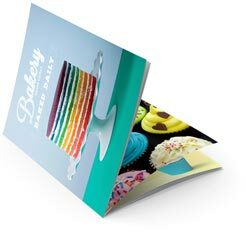 We offer an amazing array of custom papers and other custom printing effects that can really make your catalog stand out. We can also bind your catalog using perfect binding, square back binding or Wire-O binding as an alternative to the standard saddle stitching or coil binding. Make your product catalog or booklet memorable by calling our Custom Printing Advisors today at 800-­930-2423. Great product images are the essential core of any catalog, if you're investing in catalog printing - don't scrimp on sub-par photos. Use your core products or offerings to highlight what you do best. Keep your fonts and text colors to a few options at most, and your copy spacing uniform - quality presentation spells a quality product. Give your photos the space they need to draw the eye of the customer without too much text in the way. Your catalog shouldn't be merely an alphabetical product list - devote more space to top selling products, and showcase them on whole or multiple page spreads. Showing limited options prompts customers to seek out your store or website. Catalogs are a great way to drive online action. QR codes, PURLs or unique URLs are a great way to track the effectiveness. Make it easy for those ready to jump online and order something by using a coupon code that says "I saw this in your catalog." Don't have a catalog designed and ready to print? You've got options! Need help getting your catalog noticed? Check in with PFL's graphic design team to discuss your ideas. They can work with you to make sure your vision is realized on paper. From employee handbooks to glossy, full-color sales catalogs for prospective customers or technical manuals that provide valuable information for product users, a well-designed and printed catalog or booklet can be a key factor in earning trust and generating results. With our hands-on attention to detail and superior paper stock, PFL is the place to have your booklets and catalogs printed. 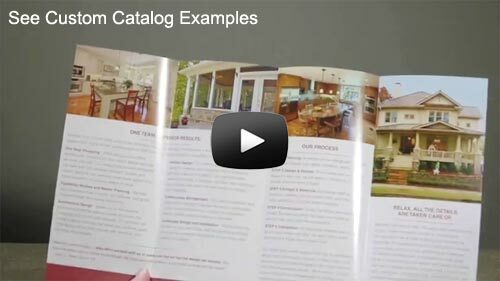 Catalogs are a department store standard, but you can easily use them for any business. Highlight seasonal inventory and specials on a quarterly basis. Provide some editorial content or customer education, creating more of a magazine/catalog hybrid. The options are limitless! Custom catalog printing sizes, formats and papers as well as additional custom finishing can be used to create distinctive designs and shapes. Rounded corners are not a problem. UV coating is a breeze. Can you have a thicker paper on the cover than your inside pages? Absolutely! Foil stamping and embossing? Multiple catalog binding options? Sure! Anything you can imagine we can create. We'll handle all of the technical details like shingling and head trim, leaving you free to create a catalog that SELLS. Place an order online or call PFL today at 800-­930-2423 and talk to one of our Print Consultants so you can make catalogs a key lever of future growth in your business! All of your hard work to design and print a beautiful catalog is lost if you aren't able to get it in front of potential buyers. Our team can help you decide on an appropriate size for mailing, whether it inserts into an envelope or gets wafer sealed, where the address should be located on the piece and the right mail class to make sure that you get the best postage rates available. We can even help you find a targeted mailing list that fits your customer profile. The PFL Mailing Services Team is the best in the business and will help you navigate the complexities of working with the USPS. Call us at 800-­930-2423 for information and pricing. You can also use our handy Direct Mail ROI Calculator to see how easy it is to increase your business. As your one-stop shop for printing and mailing, you can price and order your direct mail piece right on our ordering pages for postcards, brochures, newsletters, catalogs and greeting cards. On the product ordering page, enter your print Quantity in our InstaPrice® calculator and select your options. Enter the quantity of pieces to be mailed and your preferred mail class in the Mailing Services section to get the price including mailing. As a leading authority in Western Fine Art, the Thomas Nygard Gallery was able to highlight some of their magnificent paintings to create a uniquely compact catalog. The finished product is the small size of just 8.5 x 5.5", with a bare minimum of text copy inside. Nevertheless, with striking minimalist design this handy catalog is attractive, informative, and unimposing. Read the analysis of this featured catalog design to learn about some essential design cues such as image size and background color. With all elements in true proportion, this small catalog gets big results. Customers want to buy from brands they believe in and trust. They also demand information, and detailed product catalogs and booklets can generate orders by filling both of those needs. PFL has revolutionized Custom Catalog Printing, with sizes, formats and papers as well as custom finishing that can be used to create truly distinctive designs. We handle all of the technical details like shingling and headtrim, leaving you free to create a catalog that SELLS. "Just wanted to say thank you for the excellent service you provide. Each time I've placed an order you've checked my work and found ways it could be improved. The attention to detail and the fact that I can always call and talk to a human being is what keeps me coming back and recommending your company to others. Your prices are fair, your work consistently top rate, and the customer service can't be beat." Booklets are normally printed in the standard 5 1/2 x 8 1/2 or a smaller size. A custom size booklet can be printed to the exact size and dimensions that you need. 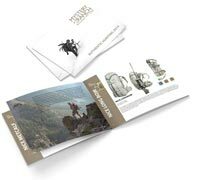 Give our prepress experts a call and we'll help make a booklet layout for the graphics program of your choice so your design will print correctly. Paper and binding options can be overwhelming. Most people choose our glossy 80# text weight stock for the entire catalog, booklet or calendar. You can upgrade to 100# gloss text for a more substantial feel. And, you can select 80# gloss text, 100# gloss text, or sturdy 80# gloss or dull/matte cover stock for the cover. We recommend this if your catalog or booklet will see sustained use, such as for parts reference. Our gloss papers include free aqueous coating for scuff resistance and extra sheen, and you can add UV coating for an ultra-shiny, high-end look and feel. Custom papers and recycled papers are also available. Request a custom catalog printing price quote. One popular choice is 80# gloss text for the insides, and 100# gloss text for the cover. This gives an enduring, rich feel without busting the budget. Request paper and print samples to see and feel the paper quality, finishes and weights first hand. We can mail your catalogs directly to your customers and prospects. See our Mailing Services Guide page for details on how we can save you time and money on your direct mail catalog project and help you find new customers with custom mailing lists. We offer a choice of USPS Marketing Mail, formerly known as bulk mail, or first class mail options. Call us with any questions on your catalog printing and mailing needs! Catalog is the preferred spelling in the United States when referring to something printed, but catalogue is also an accepted variation, though it is more commonly used to refer to a listing, collection or archive of materials. You can do great things with catalogs. See more catalog samples showing different catalog design and marketing ideas.